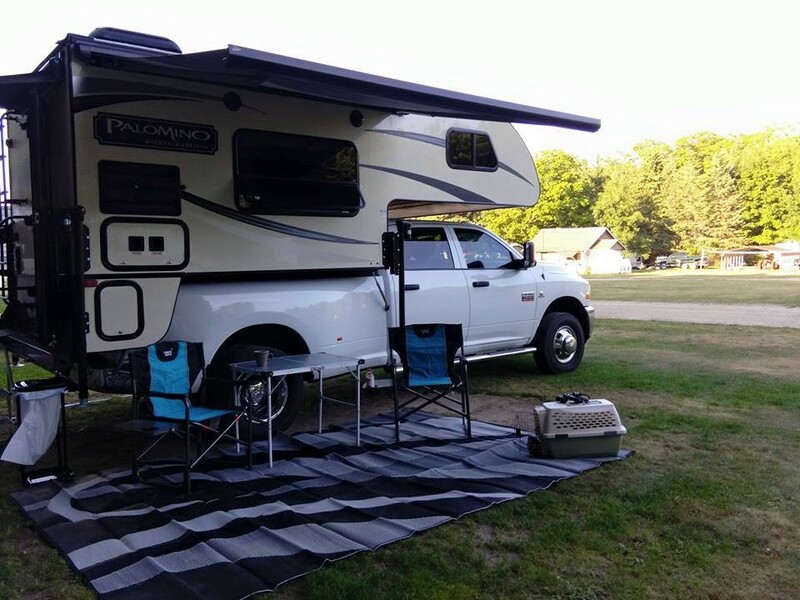 As many of you know we recently purchased a truck camper for our dually pick up truck. We wanted a camper that was easy to take with us no matter where we went. The truck camper was perfect for the two of us. 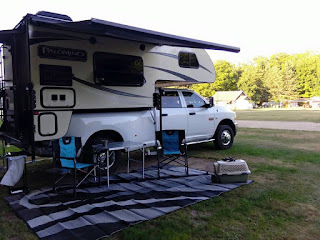 This past weekend we took out third camping adventure in our new camper. We have been taking trips to get ready for a big trip in September - we are heading to Yellowstone for two weeks. The 1st of July we went to Pennsylvania - middle of July to northern Wisconsin and our last trip was to the Upper Peninsula of Michigan. sites are a good size - we did not feel like our neighbors were too close. We had plenty of room for our camping activities. Bath house was very clean and the resort was well kept. I highly recommend the Log Cabin Resort and Campground for anyone that would like a perfect getaway from the hustle and bustle of everyday life. Michigan's UP is beautiful country! The reason we have been taking numerous camping trips is to make sure we have everything we need for our two week adventure to Yellowstone. After each trip we have a list of items we need. 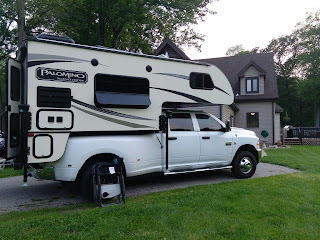 I think one of the hardest things about purchasing a new camper is the learning curve on what is needed and how to store items in the new camper. Since the Truck Camper is compact - we need to pack wisely making sure we have what we need utilizing every inch of storage space. Our goal for the next couple weeks is to get our camper ready to roll for our two week adventure. I will be posting pics and sharing helpful camping info prior to our trip. I will be sharing our Yellowstone adventure trip once we return. If you are a camper or thinking about camping make sure to stop back for some insight on camping Do's and Don'ts. I definitely have a few tips on what not to do! That is awesome. I have always wanted to go to Yellowstone! Hope you have fun! I went to Yellowstone as a kid and remember being wowed by the trip. Would love to experience it as an adult. I'm sure you'll have a blast! That is a great way to enjoy traveling. I love the canopy for picnics. I'm super jealous of your upcoming adventure! Looks like you guys will have plenty of good practice down! Enjoy! We're saving up to get a 31' trailer next summer. But I am amazed that the truck campers have a awning now! I remember them back in the day they didn't. I have always wanted to visit Yellowstone! It sounds beautiful. I'd love to have a camper and go camping and see some new places! I'm sure you will have a great time discovering Yellowstone. Hope I can visit it too in the future! Sounds like fun! I have never been to Yellowstone. I hope to visit this one day.